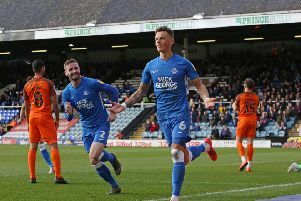 Marcus Maddison scores for Posh at Stamford Bridge. Peterborough United will play Portsmouth at Fratton Park in the quarter-finals of the Checkatrade Trophy. Posh will travel to the League One leaders in week commencing Monday, January 21. Siriki Dembele in action for Posh at Chelsea. It’s a third successive away draw for Posh who have already won at Exeter and at Stamford Bridge against Chelsea Under 21s. Posh won 3-1 at Chelsea thanks to second half goals from Siriki Dembele, Ivan Toney and Marcus Maddison. Pompey won 2-1 at Posh in a League One match in September. Full draw: Portsmouth v POSH, Bristol Rovers v Port Vale, Sunderland v Manchester City Under 21s, Bury v Oxford.